Edinburgh is more than 400 miles from London. You need to set aside the better part of a day to get there from London unless, of course, you fly - a good choice if you're on a short break. 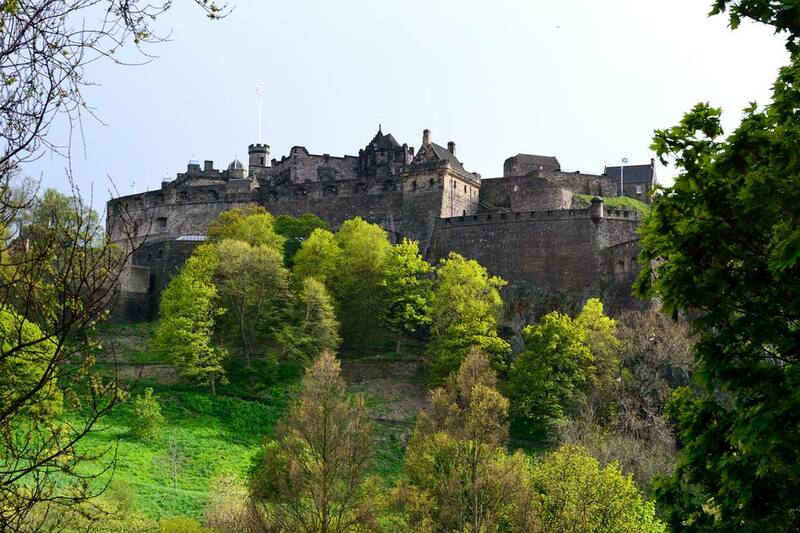 Whether you are heading there for the Festivals, for Hogmanay or simply to enjoy the pleasures of this beautiful city, it's worth your time and effort. Use these information resources to plan your trip. Regular flights from London to Edinburgh leave most of London's airports throughout the day. Ryanair flies from Stansted on Saturdays and Sundays throughout the year. Lowest, one-way economy fares for December 2018 ranged from less than £50 round trip to for budget airlines without checked bags to £100 for very early morning British Airways flights from Gatwick. The average is about £130 and there were several round trip combinations that were well over £200. Prices will depend upon how far in advance you book and what time of year you travel - with the highest fares during August when the Edinburgh Festivals are on. When comparing prices, remember that extra costs charged by the budget airlines - for reserved seats, refreshments on board and checked baggage - can really add up. The flights take about one and a half hours or slightly less. From the airport, the new Edinburgh Tram whisks you right into the center of Edinburgh in no time at all. But. when making your travel plans, do remember to factor in the time it takes to get to London's airports and the time to get through airport security. UK Travel Tip: When you factor in journey time, city center to city center, train travel usually compares favorably with the real time spent getting to and getting through airports. But, although it is possible to put together a cheap train fare to Edinburgh, the complicated ownership arrangements of the rail companies on this line mean it's easier and less confusing to find cheap flights. And Edinburgh's new tram from the airport to the city center really eases you into Edinburgh life in a matter of minutes. Trains from London King's Cross Station to Edinburgh Waverley Station, operated by LNER leave frequently (between every 10 minutes to every half hour depending on the time of day) throughout the day. The journey takes between 4 1/2 and 5 1/2 hours and advance, off-peak winter fare in 2018 starts at about £66 if purchased as two one-way tickets. Virgin Trains operate services to Edinburgh on the West Coast Line from London Euston Station. Direct trains run about every two hours and take between 5 and 5 1/2 hours. Advance tickets and super off peak fares for this service in winter 2018 started at £130.00 when purchased as two, one-way tickets. Other trains from Euston involve one or two changes. If you are willing to be flexible in your travel plans, you may be able to save quite a bit using National Rail Enquiries Cheap Fare Finder. We found a round trip combination from Euston that was only £53 each way when purchased as two one-way tickets. But on the Edinburgh route, finding these very cheap promotional fares is a bit of a lottery. UK Travel Tip - Brand Confusion on the East and West Coast lines: Virgin used to operate the East Coast Edinburgh services from King's Cross in partnership with another company. That has now changed and the East Coast service is now operated by LNER (London North East Railway). Virgin operates trains to Edinburgh that run on the West Coast line from Euston Station. Why should you care? It is very easy to confuse the services and while most rail companies can sell tickets for trains owned and operated by other rail companies, Virgin Trains West Coast Line tickets are not interchangeable with those of any other company. The Sleeper - Fans of slow travel can take an overnight sleeper, The Caledonian Sleeper. The train leaves Euston Station nightly, at about 11:50p.m., arriving in Edinburgh nearly eight hours later,at about 7:30 a.m. Costs in 2018 range from about £45.00 for advance booking of a one way ticket in a sleeper seat, to £180 for a one way ticket in a single berth cabin. If you travel first class, or solo in a standard sleeper cabin, you can take your dog. National Express run coaches from London to Edinburgh that take about 9 3/4 hours and cost between £12 and £25 each way. Book in advance as the lowest fares sell out quickly. Buses travel between Victoria Coach Station in London and Edinburgh Bus and Coach Station. It is worth exploring the Megabus website for this trip because extra cheap fares do become available. Bus tickets can be purchased online. There is usually a small booking fee. Edinburgh is 407 miles from London. It takes about 7 1/2 hours to drive, primarily on the M1, M6, M42 and A74 motorways in optimum traffic conditions. But a word of warning, the M1 and the M6 motorways are notorious traffic hot spots and you can easily spend upwards of 12 hours trying to drive this journey in one go. A short stretch of the M6 is a toll road. Keep in mind that gasoline, called petrol in the UK, is sold by the liter (a little more than a quart) and the price is usually between $1.50 and $2 a quart. UK Travel Tip - If you want to drive to Edinburgh from London and don't fancy spending hours on boring motorways, plan the trip as part of an itinerary, with stops in Yorkshire or the Peak District along the way and a visit to the up and coming culture capital of the North, Newcastle, before crossing the border into Scotland.